Ahhh... The city of brotherly love in Summer time- 80 degrees and sunny, while surrounded by 10's of thousands of people make for the perfect day to draw. Here are some of the highlights, including the premier of my new banner - thanks to www.DistinctGraphicz.com. A special thanks to fellow caricature artist Schay Glover (3rd pic) and his amazing wife for their generosity. At the bottom I added some personal photos from Easton, PA. Can't wait until next year already! Face Painting for parties- Best Rates around! Caricatures by Ryan has just teamed up with some of Disney's Finest Face Painters. Digital Caricatures are becoming a great way for the bride and groom to offer something new and unique to their guests. I will be posting some of my recent weddings on here shortly to show you how much fun they are having with this. The good ol' Pen and Ink is still the most demanded but Digital is coming in a close 2nd! I'm even offering a full color caricature (digital) to the bride and groom as a gift for hiring me for more than 3 hours. 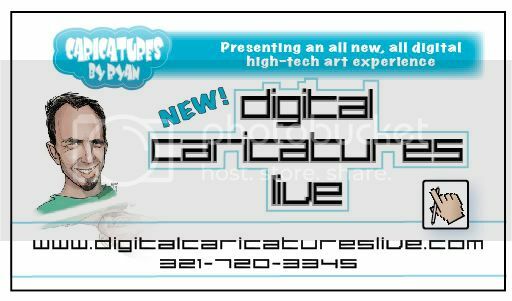 Traditional Caricatures- "The Set Up"
When I am at an event a lot of people- kids especially want to know how to get started and where to buy everything (Cost of Entry). Every artist is different but there are certainly some things that never change. • French Easel- A must! It's portable and has held up for 8 years so far! • Good Cover Stock Paper- 60lb or heavier 11 x 14 is a good size. • ULINE Bags- 12 x 16 , 2mm work great. • Beret'- Gotta go to France and get this one :) Adds to the ambiance! like pastels and very smooth. Can purchase a pack of them at Michaels. • Clip on Lights- and an extension chord. • an HB Pencil and White eraser is a necessity for sketching. • Referrence Links for items and books- See below! First off I'd like to say that you must love the digital world if you want to get into this. Its not easy and it can be a big learning curve. Most tried and true artists love the pen on paper feel and fluidity it bring to a drawing. While I can't argue that point I will say digital has its own advantages, IF, you have the right equipment. This is no time to penny pinch. The right tool will get you the right result as long as you bring the patience and the skillz! Well, I must take a moment to call attention to my equipment of choice. I was working on a WACOM Graphire 4x6 Digital Tablet and "managing". This tablet did the job but was certainly not offering the interaction I desired. Since then, I have since upgraded to the Cintiq 21 UX. This tablet is amazing. It is very natural and easy to use once you get the brushes and feel for how it all works. Here are the specs below if you would like the best price online! Most sell for over $1,999. Amazon has it for less and it was free shipping too! At big Corporate Events and major events that warrant and pay for the "supersized" effect, I offer a projection set up and a larger 28" LCD Display. This LCD is a Hanns-G or I-Inc. (same). You can pick these up on Tigerdirect.com when they run specials... usually they are between $299 - $350. As far as printing - The best portable, fast and low cost printer I've found is the Epson Picture Mate Dash. (see below) This thing prints at $0.26 a sheet, and takes only about 36 seconds to print as compared to most 75 second printers that are more expensive. I got a call from a sweet lady just west of Orlando that I had met at a Festival 6 months ago. Turns out her and her family own/run a convalescent home and wanted me to come up to draw caricatures of the 75 residents! I had not anticipated this one being such a special time but it was one that I will never forget. I made some great friends with Ed, Joy and Peter who made me laugh more than I made them. Some were lawyers, and dancers and school teachers and influential back in the day...that part is sometimes hard to remember, that they were once very active and contributing parts of our society. I hope to go back in the fall or winter. Here's a snapshot of the day of my special friends. Love Birds need a Caricature too! A New York couple wanted a Christmas Gift that was unique. This is what was delivered. Rumor has it I helped her fall in love with him all over again! People always ask me how I work. Here's a close up picture of my set up in the studio. I usually place the laptop on the side of my easel and sketch as if your right in front of me. It works nice because I don't have to remind you to smile :) This one was a Mother's Day Gift from the Grandkids of a family in Orlando.